Thanks for the neat Theme Gator. A little history for this charming old dwelling. This complex consists of a small cottage, a barn and outbuildings. The 1866 map of Port Willunga shows this allotment as the property of E.Johnson. It was later owned by Mrs Charlotte Ellbourne, wife of Arthur Edward Ellbourne, who was a sea-captain. They were married when Charlotte was the age of 15, and had 11 children. Arthur was often absent at sea, so Charlotte managed the farm on her own and neighbours used to come to her with billy-cans to collect milk for their daily needs. Charlotte lived in the home until her death in 1933. The house has since been owned by a number of people and has been both holiday house and permanent residence. The low scale of the building and chimney indicate an early date of construction, and the Walls of the cottage are decorated with geometric patterns of shells. Oh, cool! I noticed the pattern on the walls, but I wouldn't have guessed they were shells! Very cleverly designed. (I wonder if Charlotte did it in her "spare" time??) Beautiful building, and thanks for the history lesson. Picture Perfect - "Blast from the Past"
What a fresh image, Millie! It must have been truly beautiful long time ago.. It's a lovely place and I love the colour of the roof!! Great shot Milli . 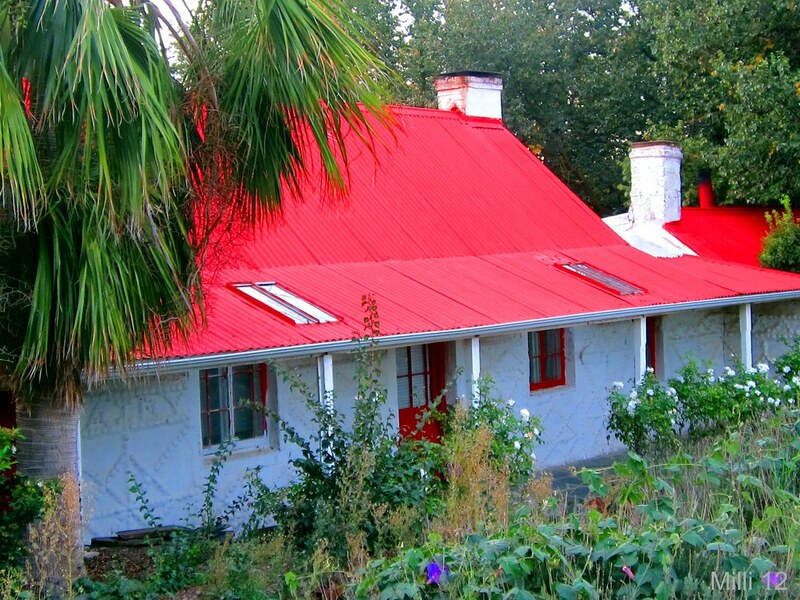 Wow...that red roof is really something! Interesting cottage. Quite exotic I would love to go inside this house. Love the colors and the tropical feel. I made it today. First day without a fever over 100 degrees. So lively house with a rich story . I have never seen a building with patterns from shells, how interesting. A great piece of early Australian history! What is the complex or is it a tourism attraction? This is beautiful. I would love to see the shells closer! How wonderful to know so much about its history! It's a beautiful house! It is a private dwelling. I think it is a holiday home these days. What a charming place! Thanks for the story behind it. That place must be permeated with hope and perseverance!